Pomegranate symbolism is very prevalent in the history of the world's religions and throughout mythology. It's hard to miss the references to this juicy, delicious, tantalizing fruit as you read through the history of different religions or myths about characters that may or may not have existed at one time. What's so fascinating about the pomegranate fruit? It's been a symbol of many things including prosperity, death and eternal life, marriage, abundance, life and rebirth, generosity, and even women's fertility. It seems as though every aspect of this fruit has some sort of meaning, whether it's the juice, the seeds, the skin, or simply the appearance of the fruit itself. Where Can We See Pomegranate Symbolism? What does Greek mythology say about this topic? You've probably heard the legend of Persephone at one time or another. Persephone was abducted by Hades, the leader of the underworld, after he became captivated by her stunning beauty. He took her and made her queen of the underworld and his wife. Her mother was so distraught about her daughter's abduction, that when she finally found her, she struck a deal with Hades. Persephone would spend half the year in the world and the other half of the year in the underworld. Legend has it that when we see drawings of Persephone, she holds a pom fruit in her hand. This supposedly means that when she returns to the world, it's spring, and she brings with her the seeds of life and fertility. When she returns to the underworld, nature goes dormant until she returns again. Judaism refers to the fruit as one of the foods of the Israelites as they journeyed from Egypt to the promised land. 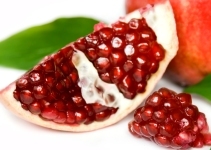 Some people believe that the fruit eaten by Eve and Adam was indeed a pomegranate, not an apple. Buddhism refers to the red fruit as a blessed fruit, along with the peach and citrus fruit. Legend refers to the pomegranate as the fruit given to Hariti, an evil demon who ate children in hopes that it would be the cure for her wanting to do such evil deeds. The Koran of Islam refers to the fruit a handful of times in its writings. In Catholic inspired paintings of the virgin Mary, she is often painted with a pomegranate in her hand, which is supposed to symbolize the resurrection of Jesus Christ and eternal life. Pomegranate symbolism is difficult to ignore as you read about the world's religions, study early paintings and art, or as you read the holy Bible, so it must mean that this fruit was important from the very beginnings of the world! 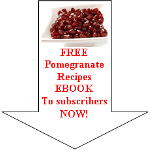 Read enough about pomegranate symbolism and want to discover more about pomegranate in religion and mythology?